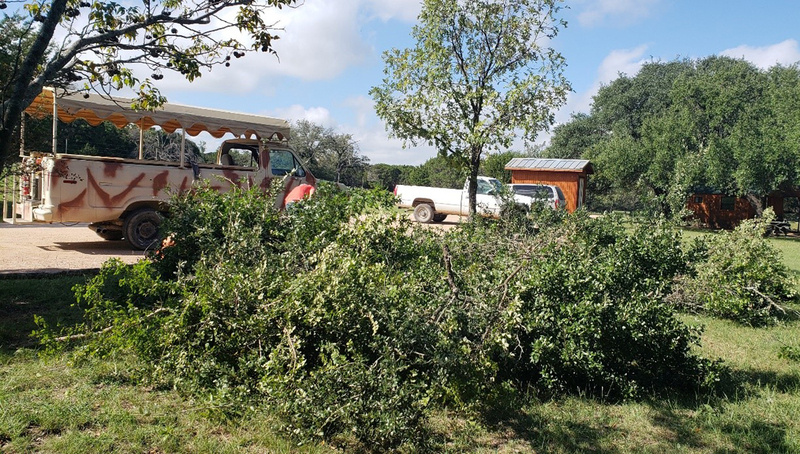 Fossil Rim’s Natural Resources Manager Caitlin Pyle shares the details of a recent major volunteer event. 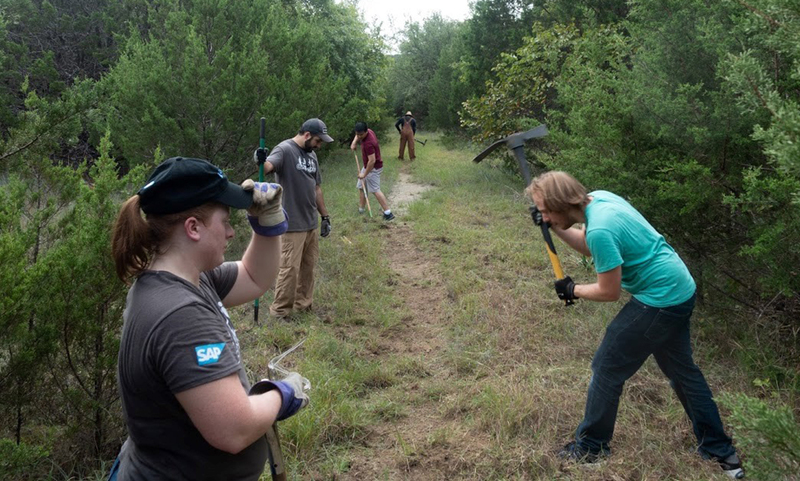 Fossil Rim staff was delighted to host a corporate group volunteer workday in early October. 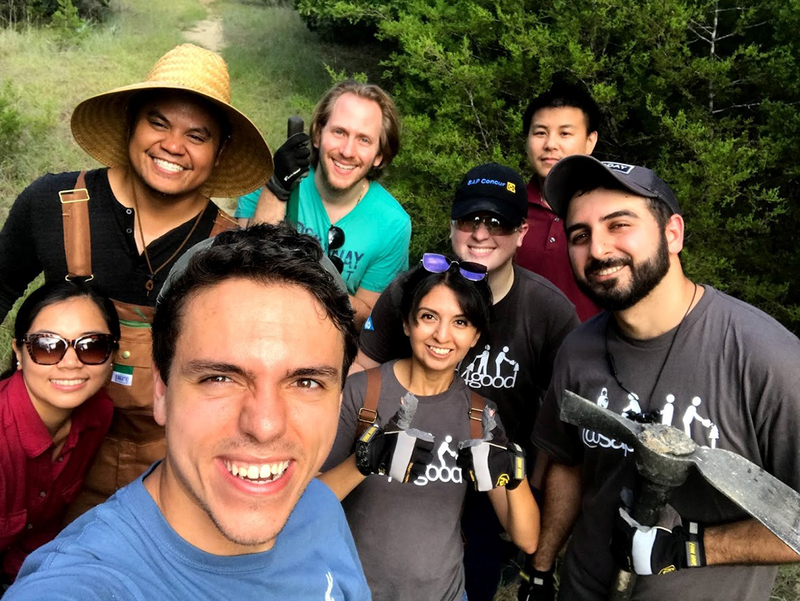 We had 25 volunteers representing SAP Concur come for the day, and they were able to assist Fossil Rim in a multifaceted way. Their work actually benefited departments all across the facility including Education, Natural Resources, the Children’s Animal Center, Animal Care, Admissions, and Lodging. 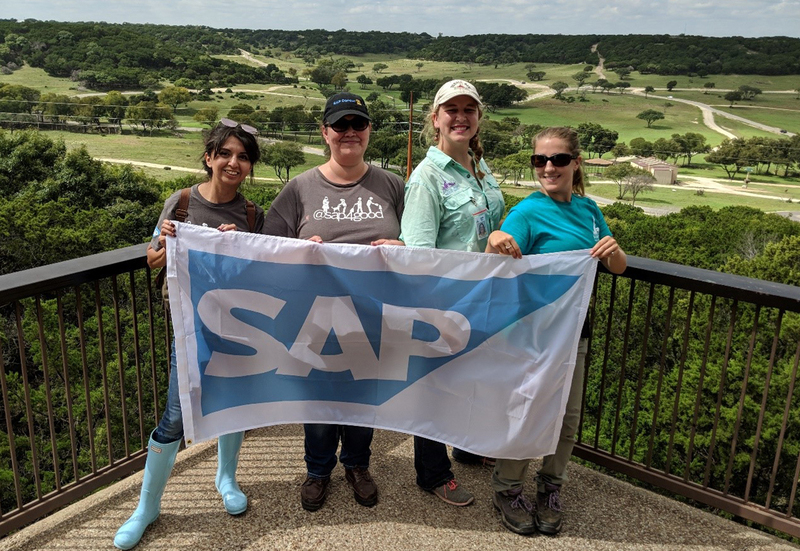 Fossil Rim staff, including Caitlin Pyle and Vanessa Hays (pictured), were appreciative of the hard work that the volunteers from SAP Concur put in when they arrived in October. One group led by Camp Manager Andrew Bullard went to Wolf Ridge Nature Camp and helped work on our public hiking trail. All of our overnight camps and day camps go on a guided nature hike, most often on Fossil Trail, so we are always working on keeping that trail clear and safe for all our guests. 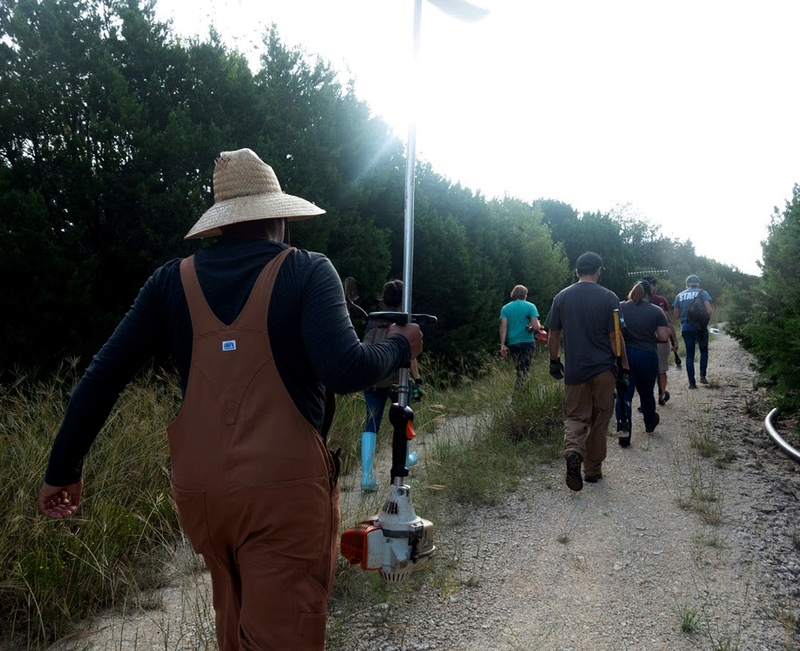 Some of the SAP Concur volunteers head toward the nature trail they planned to clear out. Natural Resources Manager Caitlin Pyle led the largest of the four groups through the park to our Foothills Safari Camp located in the Main Pasture. One of our volunteers brought his own chainsaw to help the efforts of tree trimming, which was a huge help! We have over 6,000 guests per year visit our lodging facility, and we want to ensure they have the best experience. This group of excited and hardworking volunteers were able to do in one morning what would have taken our Landscaping Technician Richard Freeland so much longer to achieve, which he was thankful for. Grubbing hoes and gloves were essential for the nature trail group to get the job done. The lodging staff prepared coffee, tea and pastries as a way of showing gratitude to the volunteers for all their hard work. Everyone who was volunteering at the Foothills Safari Camp that day was quite impressed with the staff hospitality. All of the oak tree trimmings at the camp were then used as browse for the rhinos and giraffes to eat. Our Black Rhino Intern Wade Barbour came to pick up the three truckloads of browse to share with the black rhinos later that day. This is a portion of the oak tree trimmings that were utilized by the animal care department for the black rhinos and giraffes, which require fresh browse as part of their daily diet. 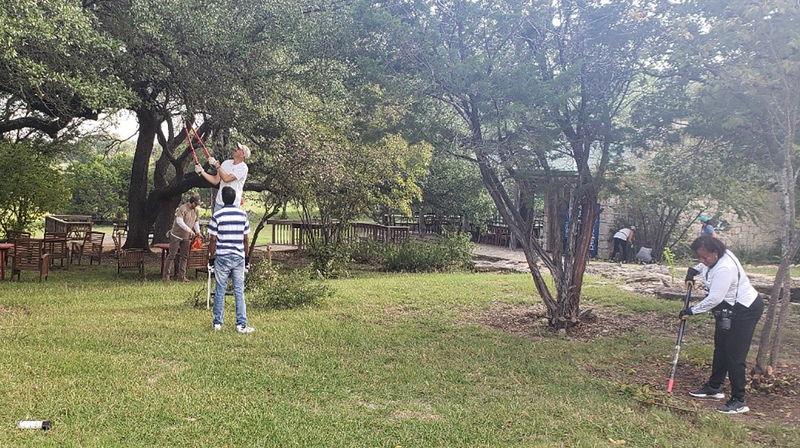 It made the act of service even more special for the volunteers to know, not only were they giving back to Fossil Rim, they were actively providing food for our animals. To get to see the giraffes up close and hand feed them later on during their guided tour was especially rewarding. Natural Resources Management Specialist Vanessa Hays led a smaller crew of the Concur Cares group down to the Admission Center at the main entrance to get their hands and knees dirty while cleaning up the flower beds and removing invasive plants from that area. The Admission Center makes the first impression for most of our 250,000 guests annually, and thus the staff was excited about the help! 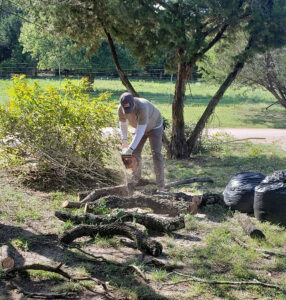 Trees that were too large to be used for browse to feed Fossil Rim animals were instead cut into firewood to be used by the education department during overnight camps. We also had some younger volunteers come for the day, as a handful of junior volunteers came with their parents and provided a helping hand at our Children’s Animal Center. One of the memorable moments for Pyle was watching this large corporate group bond and meet new people within their organization while volunteering. Some of them met for the first time in the parking lot at 8 a.m., and by lunchtime they had become more than acquaintances. 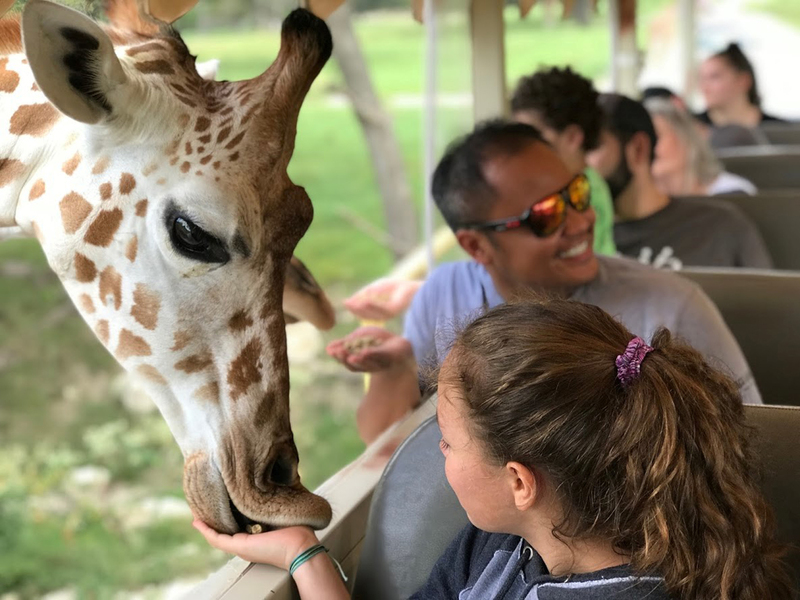 Since we had split their group up in order to tackle four different projects around the park, they were able to work in smaller groups and get to know one another, as well as the Fossil Rim staff. 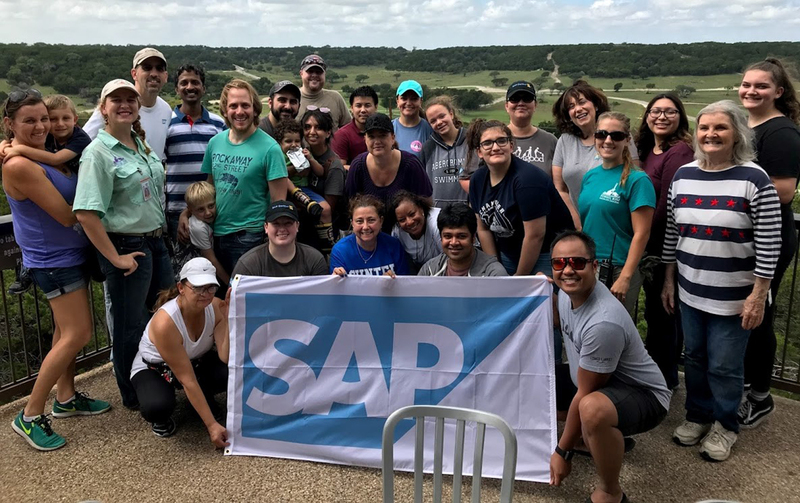 Then, the guided tour through Fossil Rim in the afternoon brought the whole SAP Concur group back together and they were able to chat and bond over their experiences. It was special to know that many of these volunteers arrived as coworkers, but ended the day as friends. 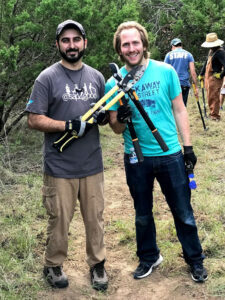 From raking leaves to trimming trees to pruning shrubs, the SAP Concur volunteer team did whatever was needed at Foothills Safari Camp and had a great time along the way. SAP Concur is an international software company with an office in Allen, Texas about two hours northeast of Fossil Rim. They place a heavy focus on corporate social responsibility with their employees being able to compile 32 hours of paid volunteer time each year. For the second year in a row, they chose to support Fossil Rim! Nothing caps off a day of volunteering like feeding some Fossil Rim giraffes.